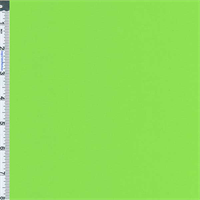 Monterey Stretch Cotton Poplin Shirting Fabric By the Yard, Bright Green. Lightweight softly crisp poplin shirting with a little spandex in the width for comfort. Semi-sheer: suitable for shirtings, use a lining or garment underneath for opacity. Monterey Stretch Cotton Poplin Shirting Fabric By the Yard, Golf Green. Lightweight softly crisp poplin shirting with a little spandex in the width for comfort. Semi-sheer: suitable for shirtings, use a lining or garment underneath for opacity. Monterey Stretch Cotton Poplin Shirting Fabric By the Yard, Fruit Punch. Lightweight softly crisp poplin shirting with a little spandex in the width for comfort. Semi-sheer: suitable for shirtings, use a lining or garment underneath for opacity. Monterey Stretch Cotton Poplin Shirting Fabric By the Yard, Orange. Lightweight softly crisp poplin shirting with a little spandex in the width for comfort. Semi-sheer: suitable for shirtings, use a lining or garment underneath for opacity. Monterey Stretch Cotton Poplin Shirting Fabric By the Yard, Soft Green. Lightweight softly crisp poplin shirting with a little spandex in the width for comfort. Semi-sheer: suitable for shirtings, use a lining or garment underneath for opacity. Monterey Stretch Cotton Poplin Shirting Fabric By the Yard, Hot Pink. Lightweight softly crisp poplin shirting with a little spandex in the width for comfort. Semi-sheer: suitable for shirtings, use a lining or garment underneath for opacity. Monterey Stretch Cotton Poplin Shirting Fabric By the Yard, Floral Pink. Lightweight softly crisp poplin shirting with a little spandex in the width for comfort. Semi-sheer: suitable for shirtings, use a lining or garment underneath for opacity. 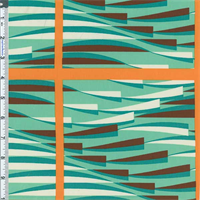 Monterey Stretch Cotton Poplin Shirting Fabric By the Yard, Vivid Cyan. Semi-sheer to semi-opaque but will be quite sheer against direct light or when fabric is stretched extensively, use a lining or garment underneath for full opacity. May be used for dresses and skirts only with a lining unless your dress is a designed for some sheerness. Vertical repeat is 30-3/4", horizontal repeat is 14-1/4", 1/2 drop. Machine wash cold gentle, tumble dry low or lay flat. IMPORTANT: Pattern is a very large repeat . Monterey Stretch Cotton Poplin Shirting Fabric By the Yard, Grayish Purple. Semi-sheer to semi-opaque but will be quite sheer against direct light or when fabric is stretched extensively, use a lining or garment underneath for full opacity. May be used for dresses and skirts only with a lining unless your dress is a designed for some sheerness. 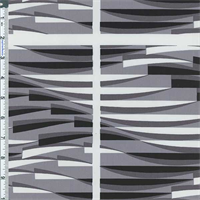 Vertical repeat is 30-3/4", horizontal repeat is 14-1/4", 1/2 drop. Machine wash cold gentle, tumble dry low or lay flat. IMPORTANT: Pattern is a very large repeat . Monterey Stretch Cotton Poplin Shirting Fabric By the Yard, Medium Blue. Semi-sheer to semi-opaque but will be quite sheer against direct light or when fabric is stretched extensively, use a lining or garment underneath for full opacity. May be used for dresses and skirts only with a lining unless your dress is a designed for some sheerness. Vertical repeat is 30-3/4", horizontal repeat is 14-1/4", 1/2 drop. Machine wash cold gentle, tumble dry low or lay flat. IMPORTANT: Pattern is a very large repeat . 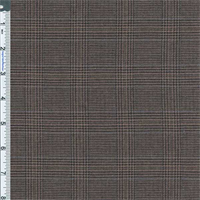 Cotton Blend Ashland Glen Plaid Midweight Suiting Fabric By the Yard, Black/Nut Brown. Yarn dyed plain weave plaid, soft surface, crisp somewhat snappy hand feel similar to poplin, not drapey. Opaque and midweight with a tiny bit of spandex in the width for comfort ease. 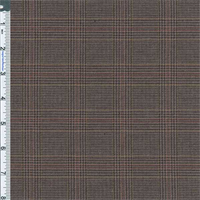 Cotton Blend Ashland Glen Plaid Midweight Suiting Fabric By the Yard, Soft Brown Mix. Yarn dyed plain weave plaid, soft surface, crisp somewhat snappy hand feel similar to poplin, not drapey. Opaque and midweight with a tiny bit of spandex in the width for comfort ease. 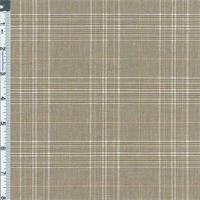 Cotton Blend Nelson Glen Plaid Suiting Fabric By the Yard, Wheat/White/Yellow. Yarn dyed plain weave plaid, crisp somewhat snappy hand feel similar to poplin, not drapey. Semi-opaque and light-midweight with a tiny bit of spandex in the width for comfort ease. 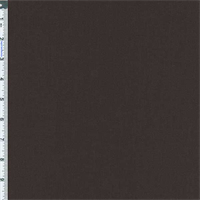 Tropical Bottom Weight Poplin 4-Way Stretch Fabric By the Yard, Brownie Brown. Soft and medium weight bottom weight poplin. Widthwise stretch, lengthwise stretch. Suitable for pants, slacks, skirts, dresses, use an underlay or lining if opacity is desired.